In order to use the library and its branch libraries you will need to register as a library patron by using an identity document. 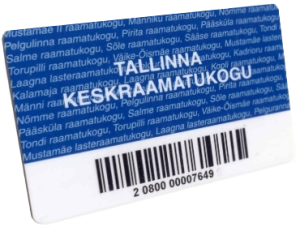 You will need to apply for a library card or register with the Estonian ID-card or the residence permit card in order to use the Tallinn Central library and its branch libraries. Library card is issued on the basis of a valid ID and has to be renewed yearly. It is possible to register with an Estonian ID-card or the residence permit card (hereafter: ID-card). Registering with an ID-card is free of charge. 3. A valid e-mail address where the confirmation of You signing and accepting the usage Regulations of Tallinn Central Library will be sent. You will need to register with the Estonian ID-card or the residence permit card in order to use the Tallinn Central library. Valid ID-card or Mobile-ID certificates and PIN-codes are required to fill out the registration form. If you are aged under 18 years, you will need parental consent form that has been filled and signed by a parent or a guardian. Send it to library’s e-mail address laste@nulltln.lib.ee. The digital signature will be stored into library readers databases. The digital signature and contact information You give us will be used to identify You, offer library services and keep statistics. If there are any changes in Your contact information please let us know as soon as possible. Having registered with an ID-card You can borrow books and use computers in all of our departments, branch libraries and in the mobile library. If You previously had a regular library card it will now be invalid so please take Your old library card with You when your first register with the ID-card. The ID-card is personal property and the card owner is responsible for all materials borrowed with the card. The ID-card must at all times be presented for registering loans as well as for checking a customer`s right to borrow. Just like a library card, You must not give Your ID-card to anyone else. In case of losing Your ID-card please let us know as soon as possible. If you are aged under 18 years, you will need the consent of either of your parents or some other adult guarantor in order to receive the card. The parental consent is valid until the patron turns 18 years of age. If a person under the age of 18 has not used library’s services for three years, they must present a new written consent from their parent. Persons 15 to 18 years of age are registered on the basis of a personal identity document, whereas persons up to 15 years of age can alternatively register on the basis of their student card. You have to sign the card taking the responsibility to follow the borrowing rules. The library card is personal property and the library card owner is responsible for all materials borrowed with the card. The library card must at all times be presented for registering loans as well as for checking a customer`s right to borrow. If the owner of a library card (either the regular library card or the ID-card as a library card) wishes for another person to be able to borrow books with their library card then the owner (person with responisbility) of that particular library card must provide the borrower with an authorization. The authorization may be written, in free form, on paper or by filling out a blank that is provided by us. The authorizer may include information about the specific library (e.g. only Kännukuke library) where the authorization may be used and information about what kind of books may be borrowed with it. The authorization may also be digitally signed. The digitally signed authorization must be sent to that department or branch library which will be visited first by the authorized person. The contact information of our departments and branch libraries is available on our webpage. The library card authorization blank may be downloaded/printed or be filled out at the library premises. The original copy of the authorization will be kept by the libarary. The authorizer may view the books that have been borrowed with their library card at My ESTER. NB! It is not possible to authorize someone to use a library card that has expired. The loss of a library card must be reported to the library immediately. A card which has been reported lost, cannot be used for borrowing. Customers are requested to destroy a lost card should it later be found. Inform the library staff of the changes in your name, home address, phone number etc. If your home address is not in Estonia and you want to borrow books, you have to pay a deposit. To verify a person’s address we use the Estonian Population Register. If you want to lend e-books from TCL you can contact us via e-mail at ellu@nulltln.lib.ee.